With several varieties of elevator handrails, we offer different styles, shapes and finishes with the ability to integrate seamlessly into any cab interior. 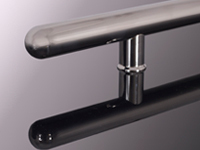 Our handrails are easy to use and install. 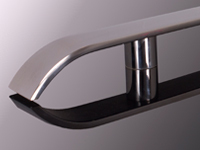 Manufactured from some of the finest materials, our elevator handrails are a great solution for any cab interior. 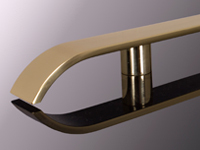 With several styles, shapes and finishes, we custom make our elevator handrails to fit precisely into the designated elevator cab interior. Install our handrails from inside the cab saving field labor time and keeping a safer working environment. 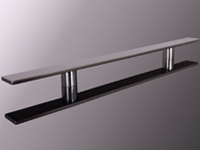 Installation requires just four simple steps to secure the handrail safely to the wall. With precise CNC machined elevator handrails built to order specifications, our handrails are fabricated with top quality materials and high industry standards to ensure top quality handrails. 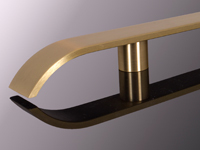 Choose from a variety of styles including round, extruded flat, solid flat, and architectural styles. 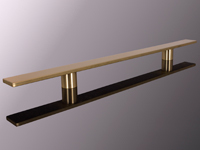 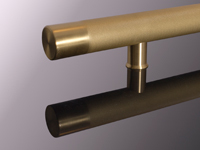 Finishes include stainless steel alloy, brass, bronze. 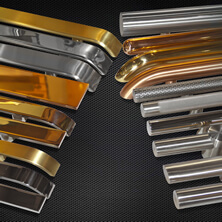 Choose from flat, bullet or bent ends. 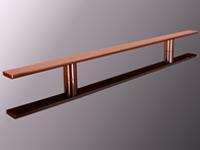 Interiors made from laminate, wood, metal, glass and more. 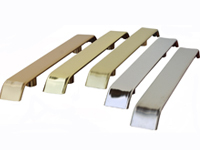 Thousands of Elevator Parts ship the same day. Our round elevator handrails are available in 1.5”, 2” and 3” in diameter. 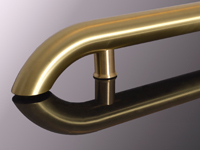 Round handrails are made from a 16 gauge wall coming in stainless steel #4-brushed, stainless steel #8-polished, yellow brass #4-brushed, yellow brass #8-polished, bronze #4-brushed, bronze #8-polished, copper #4-brushed and copper #8-polished. 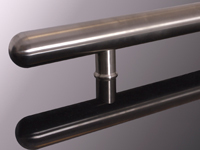 Handrails can also be knurled, containing a cross-cut pattern to enhance the look and feel, or come in Diamond Tex, an architectural finish that has a bold diamond pattern. 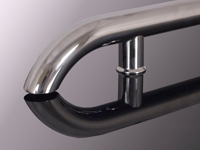 Our round handrails have three different end treatments; straight ends, bent ends and bullet ends. Our flat elevator handrails are available in 1.5”, 2”, 3” 4”, 6”, 8”, 10” and 12” wide and 3/8” thick handrails. Flat handrails come in stainless steel #4-brushed, stainless steel #8-polished, yellow brass #4-brushed, yellow brass #8-polished, bronze #4-brushed, bronze #8-polished, copper #4-brushed and copper #8-polished. 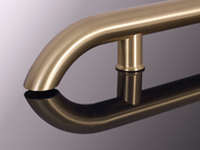 Our flat handrails have two different end treatments; straight ends and bent ends. Our continuous elevator handrails are available in round, flat and oval shapes. 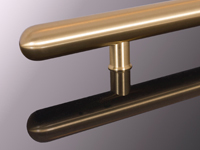 Continuous handrails come in stainless steel #4-brushed, yellow brass #4-brushed, bronze #4-brushed. 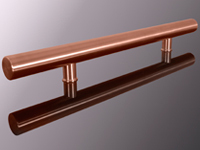 Our continuous handrails have three different end treatments; straight ends, bent ends and bullet ends. 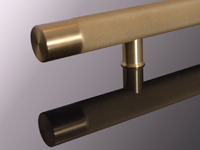 Our extruded elevator handrails are available in 3” wide handrails. 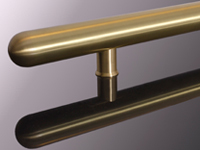 Extruded handrails come in stainless steel #4-brushed, stainless steel #8-polished, yellow brass #4-brushed, yellow brass #8-polished and bronze #4-brushed. 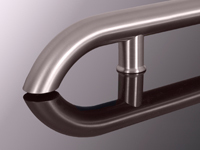 Our extruded handrails come standard with bent end treatments. 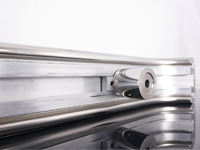 The channeled aluminum extrusion design allows for adjustable spacer locations. These adjustable spacers can slide along the length of the handrail and lock into place, allowing flexibility in the mount location of the cab interior.